This B-rated drop safe, Model USTC-01K, is a great choice for office or personal use. It's heavy-duty construction provides the highest security for its size. 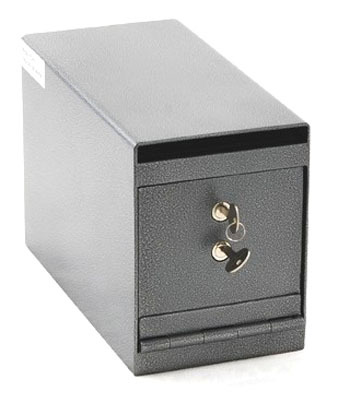 Features: spring loaded re-locker, saw-toothed baffle to protect slot, 1/4” welded steel structure, dual-key lock, powder coated grey finish, anchoring hardware included, 4 pre-drilled anchoring holes (Bottom), keyed alike is available for orders greater than 100 pcs. Specifications: exterior Dimensions - 6” W x 8” H x 12” D; interior - 5-7/8” W x 7” H x 10-1/4” D; door clearence - 5-1/4” W x 4” H; drop-door opening - 5-3/4” W x 5/8” H; door thickness - 1-3/4” (1/2" solid steel plate); cubic inch - 421; weight: 19 lbs. This B-rated drop safe, Model USTC-01K, is a great choice for office or personal use. It's heavy-duty construction provides the highest security for its size.